Pradhan Mantri Suraksha Bima Yojana is a Personal Accident Insurance Scheme launched by Prime Minister Sh. Narendra Modi. It will offer protection against death or disability due to the accident. This post is last in the series of 3 Social Security Schemes launched recently. To know more about Atal Pension Yojana and Pradhan Mantri Jeevan Jyoti Bima Yojana, you may click on the respective link. Every year in India, approx 4 lakh people die because of accidents. Out of which, approx 1.37 lakh deaths are due to road accidents. The common perception is that Personal Accident Insurance and Life Insurance are mutually exclusive of each other. It is not true. Assuming i availed Pradhan Mantri Jeevan Jyoti Bima Yojana and if i die in a road accident. In this case, the nominee of Pradhan Mantri Jeevan Jyoti Bima Yojana will receive 2 lakh sum insured under life insurance policy. Let’s say, i also availed Pradhan Mantri Suraksha Bima Yojana. In case of an accidental death, my nominee will be eligible for additional 2 lakh sum insured under Pradhan Mantri Suraksha Bima Yojana. In short, in case of an accidental death, the total sum insured will be Rs 4 lakh. The 2nd misconception about personal accident insurance policy is that only road accidents are covered under the policy. It is not true, the definition of accidents is broad but subject to certain terms and conditions. For example, personal accident insurance policies also cover accidents due to natural disaster. In my personal opinion, this cover is more suitable for accident prone people. The people who are static & there is not much of physical movement in their daily routine may consider again. Examples of static profiles are housewives, administrative or managerial jobs. At the same time, the irony is that insurance companies don’t issue cover to high-risk category i.e. accident prone category. Why Pradhan Mantri Suraksha Bima Yojana is launched? 1. Provide Personal Accident Insurance to High-Risk Category: Pradhan Mantri Suraksha Bima Yojana is right step as it will be beneficial for people who are in High-Risk category. Examples are Laborer, Mechanics, Contractors, Truck Drivers or if you are in the sales function of the organization which involves a lot of traveling/driving. 2. Low-cost cover: Personal Accident Insurance cover is one of the cheapest insurance covers. In fact, it is bundled for FREE with high-end debit cards of reputed banks. Premium under Pradhan Mantri Suraksha Bima Yojana is just Rs 1 per month. Practically, it means that it is FREE. 3. Disability Cover: Though Pradhan Mantri Suraksha Bima Yojana is referred as a personal accident insurance scheme, but it also provide disability cover both partial and permanent. 1. All savings account holder in the age group of 18 years to 70 years are eligible for cover under Pradhan Mantri Suraksha Bima Yojana. A Savings account should be preferable Aadhaar linked. 2. Pradhan Mantri Suraksha Bima Yojana is a Group Policy, not an individual policy. 3. The policy cover will be applicable from 1st June to 31st May of next year. It is renewable every year. 4. Personal Accident Insurance under Pradhan Mantri Suraksha Bima Yojana is available on the prospective basis. In layman terms, if i join the policy after 31st May, 2015 then my cover will end on 31st May, 2016. 5. Annual Premium of cover under Pradhan Mantri Suraksha Bima Yojana is Rs 12 only. It is as good as FREE. 6. Premium Payment Mode: Premium will be auto- debited from the savings account. It is the only mode of premium payment. 7. Sum Insured under Pradhan Mantri Suraksha Bima Yojana is Rs 2 lakh for Accidental death/in case of permanent disability due to the accident. In case of partial disability, the cover is of 1 lakh only. There are certain exclusions/T&C in the policy. 9. An individual can opt for the single cover. Any premium paid for more than 1 cover will be forfeited. 10. Name of the Nominee is must for enrollment of the scheme. 11. Tax deduction u/s 80C is available on the Premium paid under Pradhan Mantri Suraksha Bima Yojana. 12. Sum insured received up to Rs 1 lakh will be tax free u/s 10(10D). If the sum insured received is more than 1 lakh then TDS will be deducted at 2% from total proceeds. 14. Under Pradhan Mantri Suraksha Bima Yojana, it is feasible to opt for indefinite/longer enrollment/one-time mandate for auto-debit every year. 15. Joint account holders can join the scheme by paying annual premium separately through the joint account. 1. Suitable for People in High-Risk Category: Personal Accident Insurance under Pradhan Mantri Suraksha Bima Yojana is more suitable for High-Risk Category. This scheme is ideal for laborers, truck drivers etc. Any insurance should be need based rather based on cost consideration. 2. Personal Accident Insurance is a subset of Life Insurance: I am personally not in a favor of opting for multiple insurance plans. The reason being an operational hassle to manage multiple policies & claim settlement process. Though i agree that Accidental Personal Insurance is one of the cheapest covers but you may consider opting for high value “single” life insurance cover compared to multiple covers. 3. Personal Accident Insurance bundled with Debit Cards: You can also consider opting for Personal Accident Insurance which is bundled for FREE by some banks with their debit cards. Only pre-condition is that you need to swipe your debit card once in 30/45 days at POS. 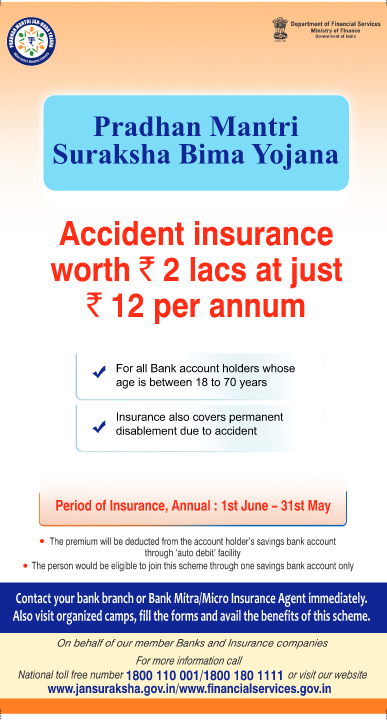 SBI also offered the personal accident group insurance policy for their savings account holder at a nominal premium. I think, now SBI will merge it with the Pradhan Mantri Suraksha Bima Yojana. You may post your queries/comments related to Pradhan Mantri Jeevan Jyoti Bima Yojana in the following comments section.